Need it fast? Please call 1-800-523-4777 or click the chat button to speak with one of our service agents to expedite this order. The Porter Cable 450PK 1.25 HP Max Torque Router Fixed/Plunge Combo Kit includes a 1.25 horsepower motor which provides the power for the toughest application. This, along with the soft-starting motor, allows the motor to maintain speed throughout the cut. The large, low-pressure spindle lock button with multiple shaft-lock detents allows for quick and comfortable, single wrench bit changes. The spring-loaded release tab allows for quick base removal while the adjustment ring enables controlled bit depth changes to within 1/64 in. The plunge base incorporates fine-tune adjustment rod for precise depth setting. 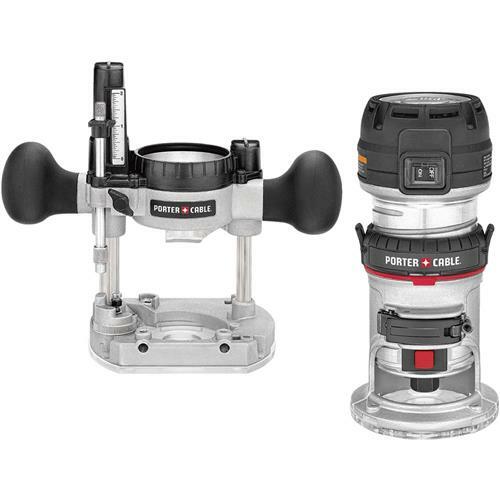 5-position adjustable turret enables stepped or repeated plunge cuts and there's up to 1.5" depth travel with the standard base and 2" with the plunge base. The 450PK includes: motor, standard base, plunge base and wrench. Please note: due to the high incident of fraudulent transactions with orders containing name brand products, orders for this item must ship to the billing address.